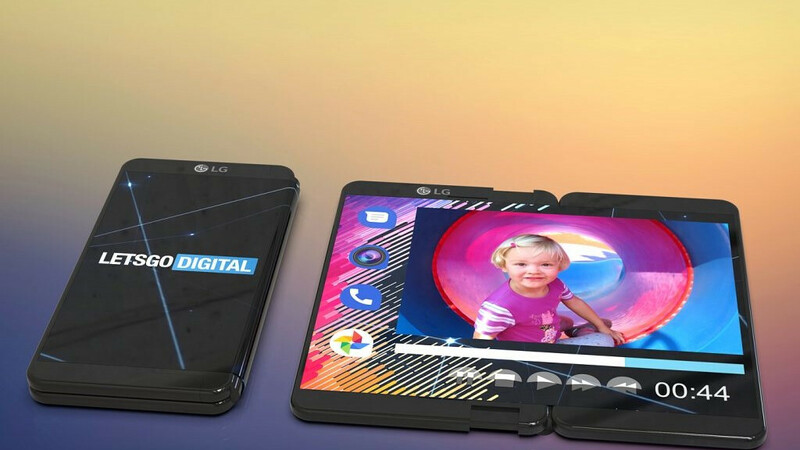 Last October, LG confirmed that it had a foldable device in development. Initial rumors suggested that a CES 2019 introduction was likely but tipster Evan Blass soon shot down these claims. According to more recent info, the device is now on schedule to make an appearance in Q3 2019 and today a new patent has hinted at what could be expected. The patent in question, which was published on December 27, describes a device that includes a flexible display on the outside. This is a first for LG as previous envisionments involved displays that were inaccessible when folded. It boasts relatively thick bezels above and below the display, while along the left sits a much slimmer bezel. As this is a flexible panel, though, the right side of the device is curved when folded. If users wish to use the device as a tablet, it can be easily unfolded by pulling the rear portion outwards towards the right side of the smartphone. But rather interestingly, a unique hinge mechanism has been fitted in between both portions. This automatically extends from the left area of the smartphone and adds an extra inch or so of display width. As expected, the user interface adapts automatically to the different form factors and, when used in tablet mode, the extra middle portion of the display is used to display frequently used apps. On a separate note, LG’s patent also describes a couple of interesting camera layouts. The first is a matrix-like setup that allows multiple photos from different angles while the second allows the cameras to generate 3D images. For now, it seems only time will reveal what LG's foldable smartphone will look like. After all, this is simply a patent which means there's no guarantee the company will ever produce a device that resembles the one described. Looks weird. But I hope they redesign it!!! I actually like this design looks very unique and practical. Just needs thinner bezels.